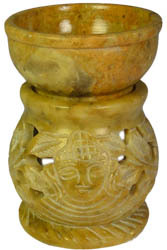 Aroma Lamp - Buddha Soapstone 3.5"
Now In: CATEGORIES → Incense Burners → Aroma Lamp - Buddha Soapstone 3 1/2"
This carved Buddha Soapstone Burner is made from real soapstone and is handmade in India. These lovely, good quality soapstone oil burners are perfect for gently heating any of our essential oils. Aroma lamps (also called "oil burners" and "oil warmers") are perfect for creating a gentle, long-lasting aroma that will fill any room. It's fun to create a uniquely-you scent by combining your favorite essential oils. Aroma lamps create a smoke-free scent for those sensitive to the smoke from traditional incense sticks and cones. Stands about 3.5" tall and requires tealights.